Republic Act (RA) 8371 or the Indigenous Peoples Rights Act (IPRA) mandates companies intending to develop the State’s resources within the ancestral domain of indigenous people and indigenous cultural communities to first secure the free and prior informed consent (FPIC) of the affected IPs-ICCs prior to the exploitation, development and utilization of the said resources while the Renewable Energy Act of 2008 allows the responsible utilization of the available sources of renewable energy to help in stabilizing the increasing prices of power for the overall benefit of consumers. The energy department previously identified the Cordillera as one of the potential source of renewable energy, specifically hydropower, because of the abundant supply of water from the region’s protected forest reservations. The Cordillera is the watershed cradle of Northern Luzon because of well-preserved community forests and State reservations that abundantly supply water to the major river systems freely flowing to the lowlands used for domestic, irrigation, agricultural, power generation, industrial among other uses. Currently, the region hosts the Ambuclao and Binga dams and supplies water to the Magat and San Roque dams. Aside from the big power plants, a good number of mini-hydropower plants are also based in Benguet, Mountain Province, Kalinga and Ifugao while there are proposals to develop hydropower plants in Apayao and other ideal parts of the region. In applying for the operation of power plants, proponents first apply with the energy department a pre-development service contract for a period of two years which could be renewed until the 25-year service contract will be granted when the proponent companies shall have complied with all the existing requirements, including the important mandatory free and prior informed consent from the affected IPs and ICCs. For the past several decades, numerous big and small hydropower companies had been applying for service contracts to develop potential mini-hydropower plants in the different parts of the region. Some big companies have been granted service contracts that caught the IPs by surprise as they had never been informed nor, more importantly, consulted about the said applications that were granted. Small companies are always being left out in the race for such service contracts because of the supposed connections of the big companies with the officials processing the permits in imperial Manila even if the small companies are the ones preferred by the IPs and ICCs considering that they know the real situation on the ground. Incidentally, the empowerment of the IPs and ICCS have resulted to some internal conflicts within the affected communities. The perceived benefits from these energy projects are often seen as individual largesse that goes to those who say ‘yes’. Taking advantage of this weakness in some communities, leaders and indigenous professionals, enterprising power generation companies employ divide-and-rule tactics just to secure the favourable endorsements from the majority of the IPs through whatever mode of inducement which is not allowed in the guidelines for FPIC. IPs who are legitimately fighting for their rights over the exploitation, utilization and development of the resources available in their domain are often voted down by the majority that lead to lasting conflicts that could no longer be settled. We deplore the dirty tactics being employed by enterprising power generation companies just to mislead the IPs and ICCs into endorsing environmentally critical projects. We also urgently call on the National Commission on Indigenous Peoples (NCIP) to seriously look into allegations of violations of the FPIC process as soon as these are reported. The NCIP must ensure all project proponents, not only of energy projects, must strictly correctly observe the FPIC process by providing all the necessary information on the project including potential impacts in a form, language and time-frame that will allow the community to study these collectively. This is not a one-time meeting but must be iterative until the community grasps the full impact of the project. Additionally, no inducement, promises, in whatever form must be insinuated nor offered, nor any action taken to force the community to favor the project. It has been observed that environmentally-friendly hydro projects are being shelved because of the failure of the proponents to secure the favourable endorsements of the host communities but environmentally critical projects are the ones being given the green light which casts doubts on the mode on how such endorsements from the IPs were secured by those interested to pursue such projects. 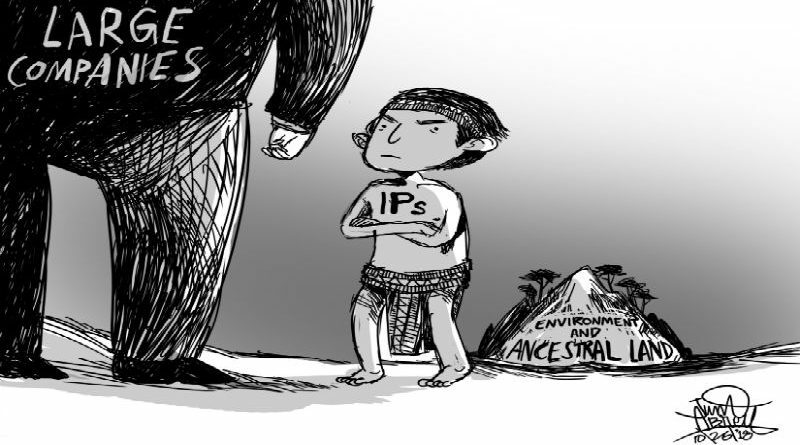 IPs must exert extra effort to study proposals for environmentally critical power projects and must continue to be vigilant about what is going on in their communities and continue to be critical about such questionable activities considering that what everyone is fighting for is the greater interest of the people. Let us remain to be circumspect about our decisions when development projects are being brought to the fore for our appropriate action. Let us not to allow the present and future generations of IPs to suffer the consequences of our ineptness and incompetence in our judgements. We should always take into consideration how we can maximize our region’s potential resources that will translate to environmentally-friendly development beneficial even beyond our lifetime.